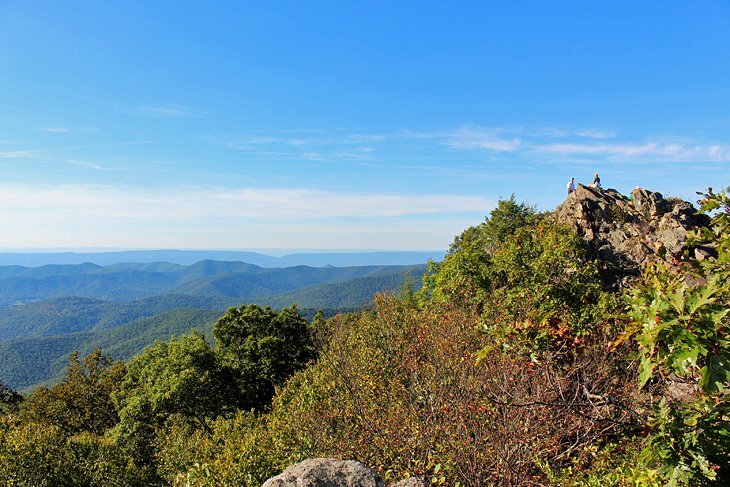 The trail begins at the Upper Hawksbill parking area at milepost 46.7 and leads up to the summit, covering 2.1 miles round-trip. The ground is even and follows a fire road part of the way, making it suitable for most hikers. This is a great late afternoon hike that typically takes about 1.5 hours to complete. If you are traveling with two cars, it’s possible to combine Upper Hawksbill Trail with the Lower Hawksbill Trail by parking a vehicle at each trailhead. While the typical direction of this hike is clockwise, some people start out in a counterclockwise direction, using the Appalachian Trail to take them to a lookout just short of the peak, with a 180-degree view, and then return the same way they came in. This is an easier alternative that does not require doing the rock scramble. A better option, for people who have time to do only one hike to a lookout, is to hike the Upper Hawksbill trail or the Stony Man trail. The parking area for the Bearfence Mountain trail is at approximately milepost 56.5. Pets are not allowed on this trail.